An as. 26 mm and 10.05 grams. In the second century and the first half of the third century some vota types do not explicitly say "vota" but refer to the celebrations. "PRIMI DECENNALES" ("the first ten years") types. An as of Antoninus Pius . This type has a date (TRP XI) on it. A sestertuus. 31-30 mm. 24.87 grams. Refers to year 22 = 158/9. Emperor veiled and togate holding patera over tripod altar, (tiny) bull behind altar. "DEC II" refers to ten years for the second time. RIC 1008. BMC 2046. Sear II 4261. The TRP date is year 22 while the vows are paid for 20. This may be because the reckoning of TRP powers changed in 147 when Antoninus Pius finished year 9 and had year 10 and began year 11, effectively squeezing two years into one. Marcus Aurelius, Caesar 141-161, Augustus 7 March 161-180. Year 25, which is Dec. 170- Dec. 171. 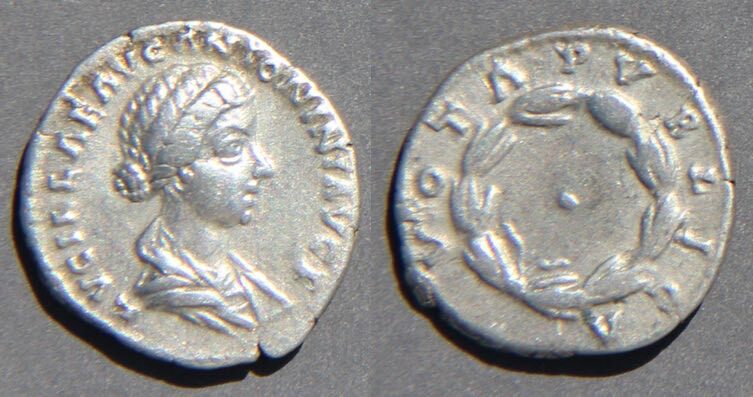 This coin mentions year 10 as Augustus, not since he became Caesar. 161 was year 1, so 170 was year 10. This coin was struck as or after the tenth year was concluding. Sear II 5495. 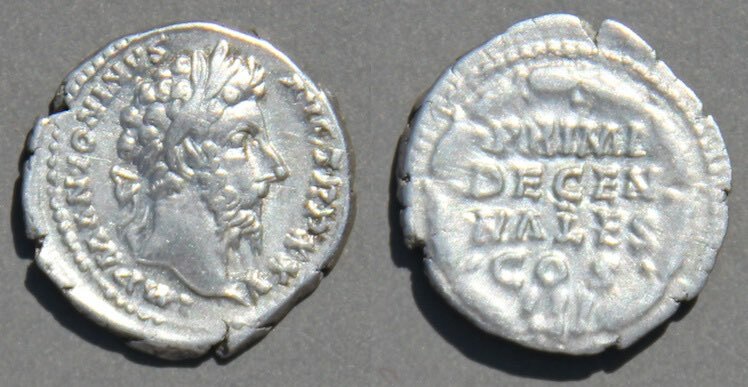 RIC 792 (Lucius Verus) "R2". BMC (M.A. and L.V.) 331. The Reka-Devnia hoard had only 2 compared to 98 of the previous type. Return to the main page on vota coins. Leave the pages on vota coins and go to the Table of Contents of this educational site.